What drives your marketing – FOMO or your customers? In 2016, we started ConvertFlow and embarked on a journey to help marketers perform better. 2.5 years later, after countless customer conversations, screen-share calls and in-person meetings with ConvertFlow users from all over the world, we’ve learned a lot about the workflows of marketers at small businesses. We’ve been able to get valuable insight into what tools marketers use, who marketers collaborate with on their teams, what roadblocks marketers face, and much more. Our findings from this period of intense customer development has surprised us, to say the least. In fact, the knowledge we’ve gained from hearing out thousands of marketers who have come to us to help them do their jobs better, has inspired us to “evolve” the original mission we set out to achieve when we started ConvertFlow. You see, we originally set out to help companies increase their website’s “conversion rate” metric using website personalization, in a way that was easy for marketers to adopt. ConvertFlow’s old website and original value proposition. At the time, this seemed logical, being that site personalization is effective at boosting conversions and directly impacts the revenue growth of companies. In other words, it was a challenge worth tackling. Although we’ve been successful with helping our customers increase their conversion rates (ConvertFlow customers see a 2x-4x increase in conversions on average), over time we discovered that the problem with this being our primary mission is that it only served a metric at our customer’s company. We found our original “mission” didn’t fully serve our customer, the marketer on the team who’s implementing new campaigns, day in and day out. By striving to genuinely listen to our customers and understand their problems as marketers doing their job, we began to move beyond just looking for ways to improve their website’s conversion rate. We began to study their workflows as marketers. We got a better understanding of what their work looks like, which stack of tools they use and why they use them, as well as learned about which team members they collaborate with and the roles each member plays in their marketing. Through this, we soon began to identify ways ConvertFlow could greatly simplify their workflow and help our customers do their job more effectively. Custom coding forms, website CTAs and landing pages are too difficult and time consuming. Waiting on developers to do this kind of work takes far too long, making launching campaigns very slow and costly to implement. Too many conversion tools were being used to avoid the pains of custom-coded solutions. This was creating a chaotic mess of logins and interfaces to learn. Each tool with its own subscription bill, often scaling based on website traffic. The result? The costs associated with their marketing stack was increasing by thousands every year. During our original mission to improve our customer’s conversion rates, we discovered that the underlying problem was the workflow marketers and their teams were using, and the roadblocks they were facing when implementing conversion campaigns on their websites. 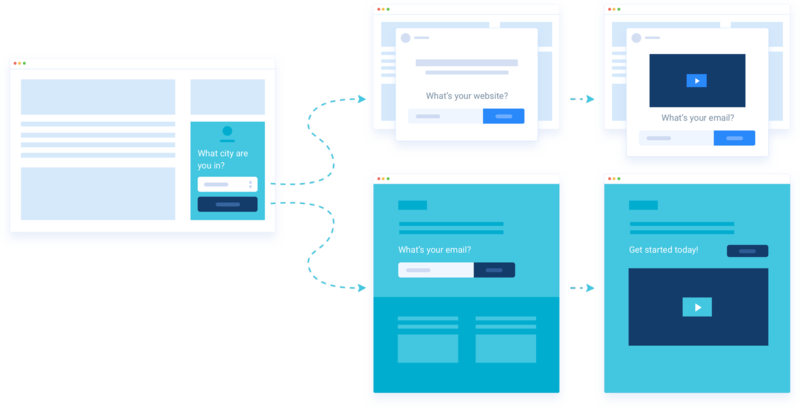 The fact is, many marketers who’ve been successful with ConvertFlow once had complex and messy workflows when implementing conversion campaigns on their site. They either had too much custom code, or too many tools. But after they started using ConvertFlow, they were able to start implementing new marketing campaigns faster and easier than ever before. And they didn’t have to write a single line of code or wait on developers. By improving their workflow, and reducing the time required to launch conversion campaigns on their website, a single marketer or a small team can implement far more marketing campaigns at a much faster rate. While this can certainly lead to a significant lift in conversions across their funnel, what’s more important is that it allows marketers to learn at a faster rate, drive more engagement with their audience and ultimately win more customers. An improved workflow also empowers small marketing teams, which are often made up of one primary implementor, to execute on the same level as much larger teams. You’ll see multiple cases of single marketers who’ve improved their workflow using ConvertFlow. You’ll also see the significant results they’ve achieved for their companies. That being said, we’ve concluded that a successful ConvertFlow customer is a marketer at a small to medium size business who can take marketing campaigns from idea to launch without writing a line of code or getting a developer involved. Many of these marketers have never implemented advanced site personalization campaigns or have had to run a split-test, even though ConvertFlow’s original objective was to help marketers adopt these kind of advanced strategies. Believe it or not, you’d think that the marketers who get the best results are the ones using all the bells and whistles. Not so! We found the opposite to be true. From what we’ve seen, the most successful marketers are the ones who launch targeted campaigns faster and more frequently. By seeking simplicity and having a better workflow, they’re able to focus on what they do best, which is promoting their brand, learning what works and driving more traffic. With this more evolved understanding of what truly helps our customers succeed, our team has built a new and better version of ConvertFlow specially for you, the professional marketer. A new version that’s designed to make launching your conversion campaigns faster and easier than ever before. If you’re like most marketers in 2018, you probably have tried, or are paying for, an ever-growing stack of conversion tools for your website. Sure. All these tools serve their purpose, but they often start out as a quick fix to get something launched on your site without having to loop in a developer or custom code it yourself. Unfortunately, over time, this “quick-fix” approach becomes too expensive when it comes to time spent managing tools and budget. And before you know it, all these tools stacked together really start to add up, especially when your traffic begins to scale to 100k+ visitors per month. That’s right, we’ve seen many marketers paying thousands of dollars a month in subscriptions for different conversion tools, on top of what they pay for their email marketing, CRM and analytics tool. Maybe you know someone like this? And that’s without considering the time and workflow costs of managing them all. Each tool has to be learned. There’s another log in to remember and another interface to be managed. Of course, each new tool has to be integrated, be reported on, etc. Well, you get the idea. If you’re a marketer on a small team, I think you’ll agree that this is too much for one person or a few people to manage. It can also eat up your marketing budget as time goes by, and as your use cases build up. All of these tools have many things in common. A way to customize your message, visitor targeting rules, integrations with your email marketing software, performance statistics, etc. This is all incredibly redundant. Why can’t it all be managed in just one place? I mean, marketing shouldn’t have to be so chaotic and expensive, right? We agree, it shouldn’t. But that’s not the only problem. Each of these conversions tools, widgets and plugins is designed to do one, or maybe two things. To make matters worse, they don’t seem to evolve with the times. Their UX designs start to look outdated. And they begin to look kind of “spammy”. These tools are not made for professional marketers who need to create on-brand marketing. If you look closer, many times you find that the creators of these tools and plugins were people who wanted a tool to sell. They chose a tactic to build a tool for, outsourced development of the software, and connected a billing system. Then they started selling. You know what I’m talking about – the gimmicky tools with spinners, countdown timers and in-your-face designs that look like casino signs you’d see driving down the strip in Las Vegas. Anyhow, they didn’t continue to evolve and grow a real solution that truly serves their customers and solves the real problems their customers are facing day in and day out. Before ConvertFlow was launched in late 2016 , like many of our customers, we too were guilty of paying for too many single-purpose conversion tools that we were using for ourselves and our clients. Then, we’d compensate for the inadequacies of these tools by adding custom code, lots of pages, forms, popups, API connection scripts, etc. Looking back, with the first iteration of ConvertFlow in our hands, we were able to cancel many of those single-purpose conversion tools, and consolidate most of them into a single platform. To this day, our team members who manage our own site’s ConvertFlow implementation haven’t had to write a line of code since we built the first version of the software. Guess what? Now with ConvertFlow 2, our customers and our team are able to consolidate everything within the ConvertFlow platform. Finally, just one monthly subscription rate. One account to log in to. One interface to manage. Plus, a greatly simplified workflow for marketers. With CF2, you can quickly create and launch almost any type of conversion campaign on your website in minutes. And you can do it without coding. No more waiting on developers. No more expensive and chaotic mess of conversion tools and plugins. Now you have everything you need to convert more of your website visitors. All in one place. 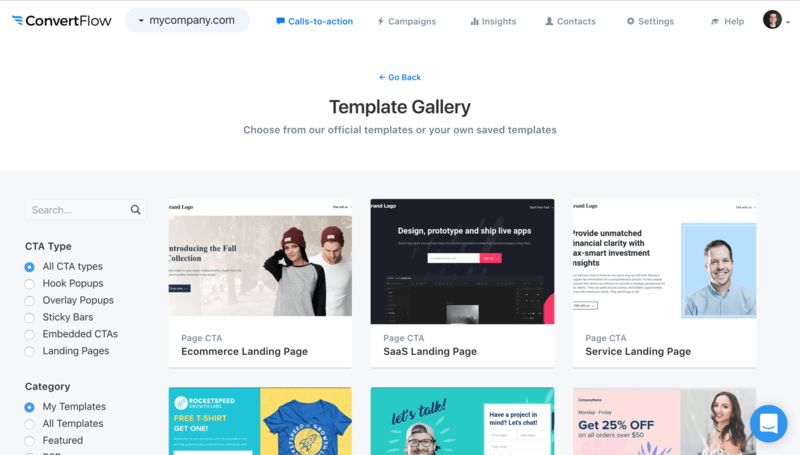 From one easy-to-use visual builder, you can build all of your website’s calls-to-action without coding. Whether it’s something as simple as a form to embed on your home page, or as robust as a 5-step page funnel, you can launch a new conversion campaign on your website in a matter of minutes. ConvertFlow’s suite of conversion tools has now expanded beyond popups and forms. 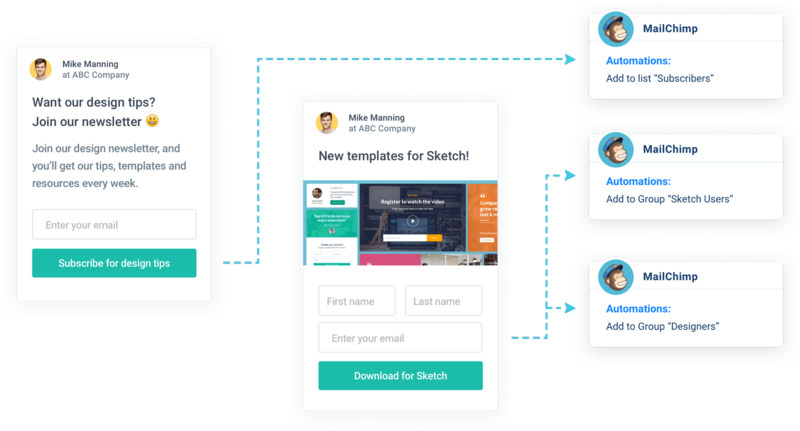 From one visual builder, you can build buttons, forms, popups, sticky bars, surveys, quizzes and now you can even build your landing pages from within ConvertFlow. No coding. No developers. No headaches. 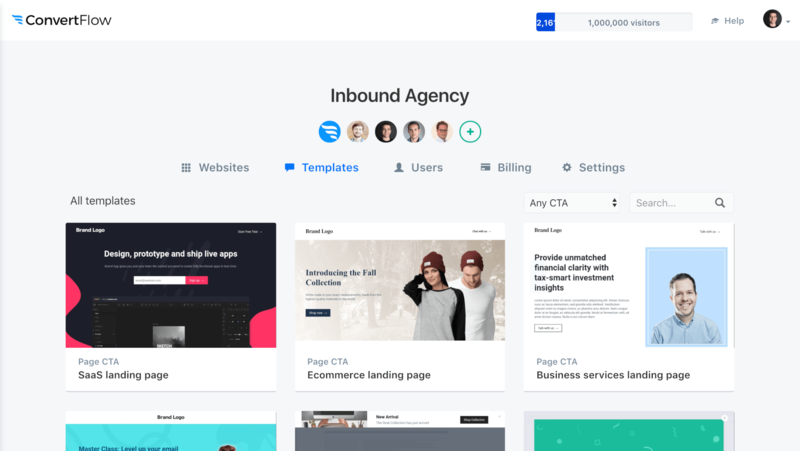 In other words, all of the website content designed to convert visitors can now be managed by one marketer on your team. ConvertFlow 2 gives marketers the control they need to run with their best campaigns – without any hiccups. All from one simple, collaborative platform. All of your CTAs now are editable using the new builder. ConvertFlow’s builder creates automatically mobile responsive CTAs, however sometimes to get a cleaner look, you’ll need to have some control over the mobile experience. You can now switch to a mobile device sized canvas. Also, to avoid having to create entirely separate content, you can now apply special spacing and alignment settings for mobile viewers. You can also simply hide/show elements and sections on desktop or mobile, allowing you to create separate content for different devices within the same builder. Examples include showing a form with fewer fields on mobile than on desktop. One of the new element types in CF2 are “rows”, which let you add simple rows inside of sections. Have you ever wanted to build a pricing table or content with more than 2 columns in ConvertFlow? Well now you can! Click on the “Confirmation Actions” button and you’ll be able to control what happens when a visitor chooses a survey option. Also, you can trigger automations in your integrated tools and fire conversion pixels by adding a custom script. With ConvertFlow 2, we designed the new builder 100% with multi-step in mind. Now you can quickly add steps, scroll through each step within the builder and customize content effortlessly, whether it’s a multi-step form, a multi-step quiz or a multi-step page funnel. 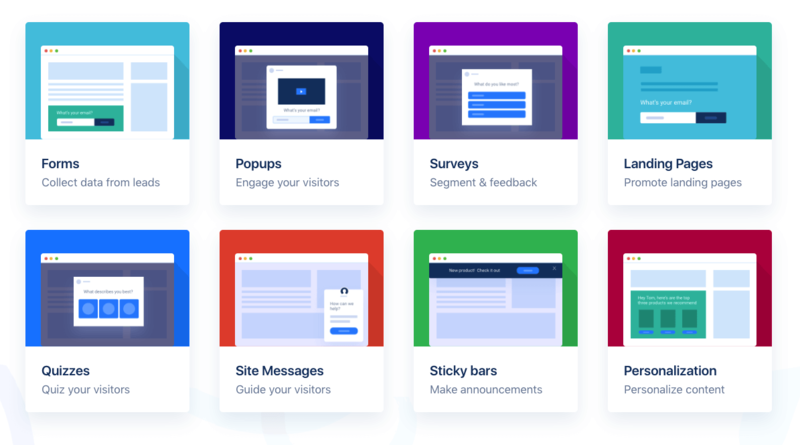 Every type of CTA built with ConvertFlow uses the same visual builder. This means it will always be a consistent experience across the board for you and your team. 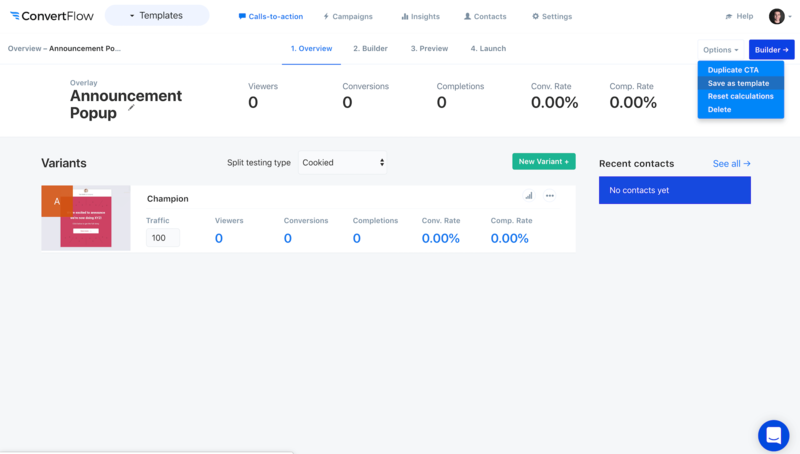 With ConvertFlow 2, we’ve baked ConvertFlow’s powerful personalization rules right into the visual builder, allowing you to conditionally control how your visitors progress through your multi-step funnels, based on their form field submissions, survey selections, CRM data and even more. Our new “Conditional Actions” feature makes it easy to control what happens for each visitor segment when they complete a form, button or survey. – You can send leads who submit a form to different thank-you URLs based on their “Team Size” dropdown selection in your form custom fields. – You can progress quiz takers to certain outcomes based on their answers. – You can segment leads who meet certain conditions into different tags, lists and segments in your email marketing tool. – You can conditionally fire specific advertising conversion pixels and custom scripts. – After completing any form, button or survey, you can trigger different CTAs based on certain conditions (ex: display different overlays based on survey choice). When you add skip logic, just like with conditional actions, you’ll be able to add conditions and control which CTA step the visitor is taken to if they meet those conditions. For returning visitors who have already completed the first step in your survey and dropped off, you can now skip them to the next step in the survey to increase your completion rate. For people who have already registered for your webinars, you can now skip them to a step in your funnel that drives them to attend, or to a step that displays a gated webinar recording. For visitors that have already subscribed to get access to your gated content, you can now skip them to the funnel page that delivers your gated content. 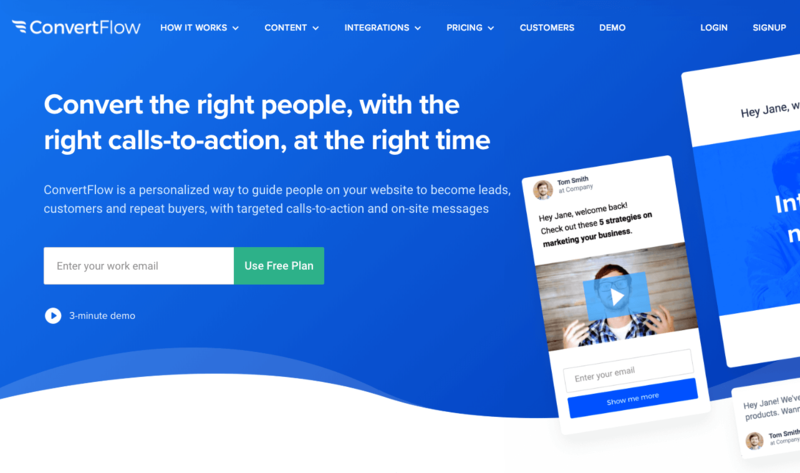 By showing the right steps in CTAs and funnels to your website visitors, you can increase completion rates for your forms, surveys and quizzes, and get the data you need from visitors to personalize your marketing. Now, all of this can be managed from within the ConvertFlow builder. No coding required. With ConvertFlow 2, anyone using ConvertFlow can make a call-to-action and turn it into a template. Just click “Save as template” in your CTAs options. 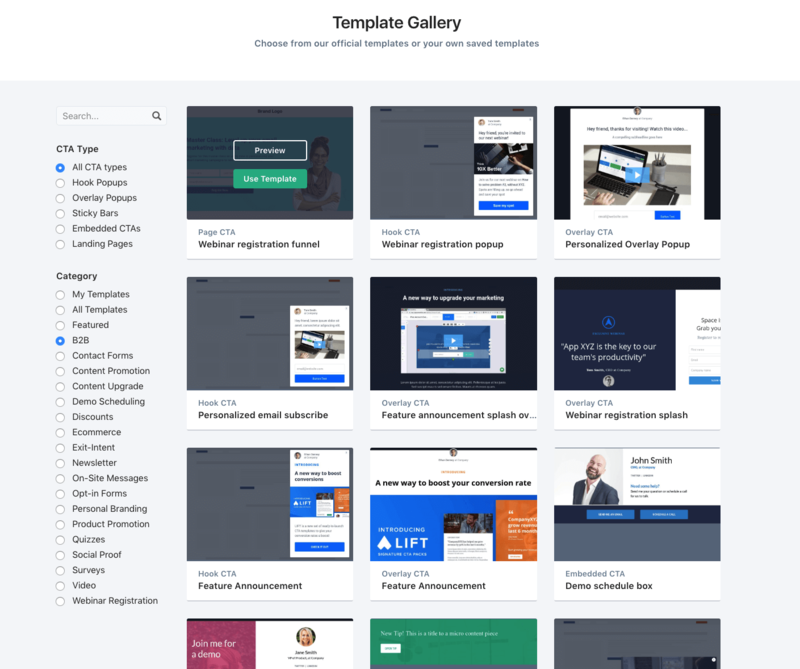 The saved template will appear in the Templates Directory when you create a new CTA from any website in your account under the “My Templates” category. Also, once you’ve saved a CTA as a template, it will show up in your account’s templates manager. Creating your own templates opens up a whole new world of possibilities. 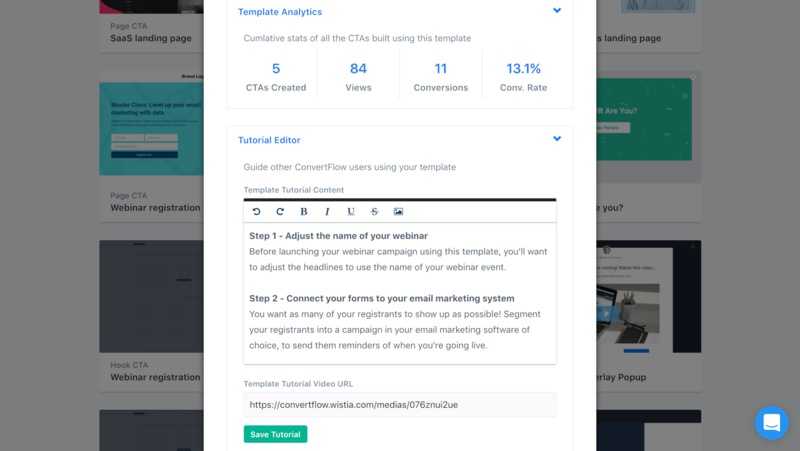 If you’re a marketer using ConvertFlow to provide services to your clients, or you simply want to give other team members material to work with as they create new campaigns, you’re going to love this new functionality. Through the creation of templates, consultants, agencies and teams can streamline their workflow by building proprietary digital assets that give them more leverage. Digital assets that help them decrease the time and effort required to launch new campaigns and see measurable results. Just click to manage a template, and you’ll be able to give it a name and add a description. You’ll also be able to copy a “share” link. By using this link to share your template, you can give anyone access to it. Cool right? If the recipient of the link isn’t already a ConvertFlow user, they’ll be able to create a free account and immediately start using the template you created. If the person is already a user, the template will simply be added to their account. And it will be ready to use whenever they launch their next campaign. As a ConvertFlow referral partner, any users who sign up using your template links will be attributed to you. As the creator of the template, you’ll be able to see it’s usage stats. For example, the total number of CTAs that have been created using your template. As your templates are implemented on websites, whether they’re your own sites or sites than belong to other users, you’ll be able to see the accumulative performance of each template you create. This new feature gives you stats on how many combined views and conversions the template has generated. It will also show you the overall conversion rate of all the CTAs that were created using your template. You’ll also notice that you can add tutorial content to your template within the manager, as well as a link to a tutorial video. We added this teaching capability in case you would like to help other ConvertFlow users implement your template correctly. Your template tutorial will be accessible by clicking the tutorials icon on the bottom-left corner of the builder where your tutorial will show. It will also be credited to your ConvertFlow user profile. 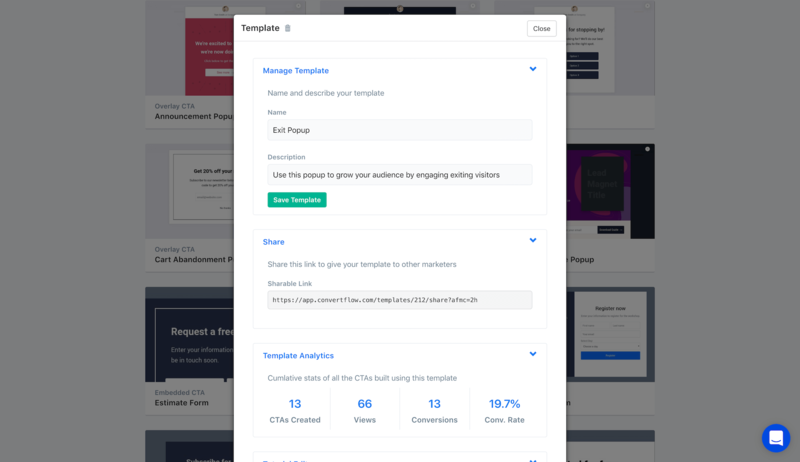 With these new templating tools, marketers finally have a platform to create and share their work in a way that helps others implement their campaigns faster. Our goal was to give marketers a new way to measure the impact of the work they’ve shared with others. We’re excited to see what kind of templates our customers build! And we’re looking forward to the continuous expansion of ConvertFlow’s platform in a way that builds a community of results-oriented marketers that are helping others succeed. You can get access immediately! Just login to ConvertFlow. If you haven’t created a free ConvertFlow account yet, click here to sign up for ConvertFlow’s free plan and you can use ConvertFlow on website for up to 500 visitors a month free of charge, no credit required. If you’re already a user of ConvertFlow’s free or paid plans, head to your website dashboard and follow the instructions on how to activate CF2 for your website. Using CF2 doesn’t change the rate or limits of your subscription billing. This means, you’ll be able to access all of the new features described above at no additional charge. 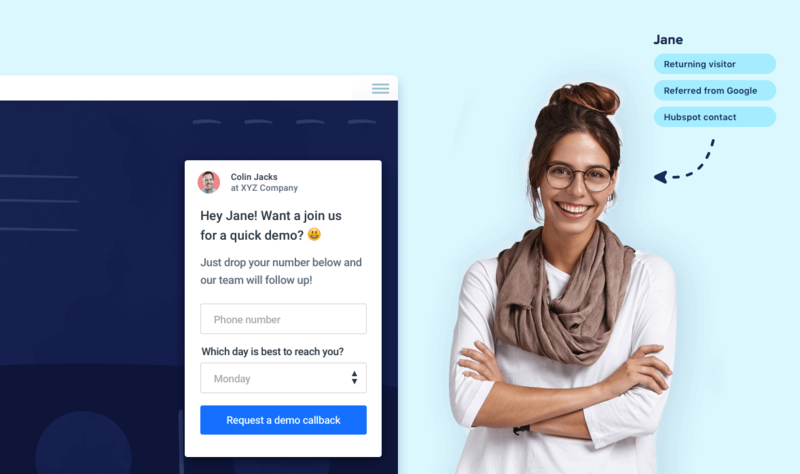 If you have any thoughts about our new product direction as the all-in-one platform for converting your website visitors, please feel free to share them with us via Intercom live chat, so we can continue to improve our messaging and our product roadmap for you. Jonathan Denney is the Co-Founder & CTO at ConvertFlow.